The first three verses of the Torah are perhaps the best-known sentences of the Hebrew Bible. They may also very well be the least understood. In Awesome Creation, Rabbi Yosef Bitton delves into these verses with an open mind and an open heart. Drawing on classical Jewish sources as well as current scientific data, Rabbi Bitton offers a fresh reading of the initial words of Scripture. Among the subjects covered are the coincidences and differences between the Big Bang theory and the Biblical Creation story, the unexplored consequences of Creation ex nihilo, the controversies surrounding the age of the universe, the state of our planet upon its creation, the natural forces used by the Creator to reshape His world, and the enigma of the nature of primeval light. 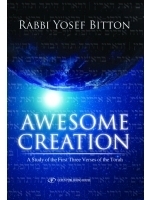 Throughout his book, Rabbi Bitton emphasizes the importance of an accurate comprehension of Biblical Hebrew, as explained by the Rabbis of the Talmud and the classical Torah commentators. Through a precise understanding of each word of these verses – and thanks to today’s modern scientific knowledge – we are able to appreciate, as never before, the beauty and sophistication of the Biblical story of Creation.